If you are on a bridge deck or another site with restricted depth they are of limited use.If there are no drains to discharge into they do not solve the problem. In those cases we offer The Flood Gobbler. This steel unit collects rainwater and either removes it to a drainage system or returns it to the road at a more convenient location without it going below road level. The system is supported by a range of stop-ends, T s and elbows. 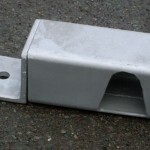 Silt traps can be supplied and access covers present no difficulties. It is interchangeable with our Kinghurst Bypass Kerb and Nib Nobbler. We are pleased to customise the units to handle particular problems. The units have 3 fixing options as illustrated below. 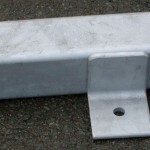 Type B – Angle brackets welded to the back of the unit can be bolted in and retained with resin anchors. 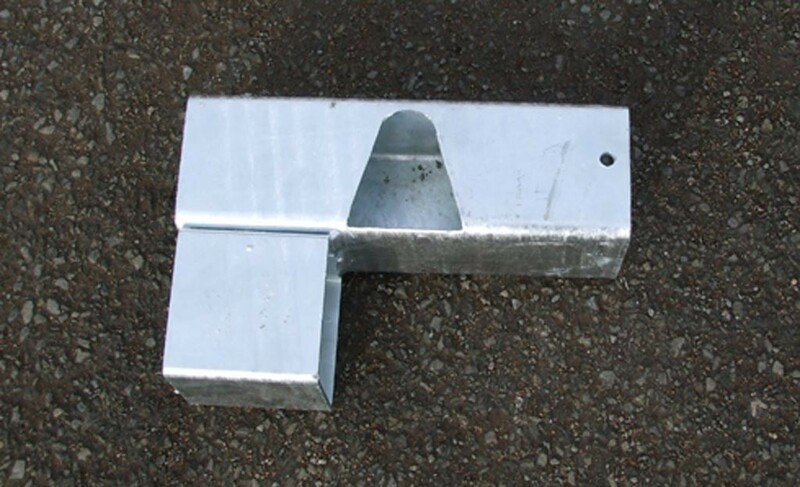 The ducts are available in 100xl00 and 150x 100mm sections and other sections can be supplied if required. Typically this steel product with relatively thin walls uses over 80% of its cross section to carry water. This compares favourably with a much lower capacity for a concrete unit which requires much thicker wall reducing capacity for any given cross section. The system is usually supplied in 2.5m sections. Other lengths can be supplied if the design requires it. When longer runs are called for the units are butted. At present the system can only be supplied in straight runs. 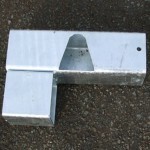 The units are made from Steel to BS EN 10210 and is galvanised to BS 729. The material can be cut on site with a suitable machine. We recommend the cut face is treated with a cold galvanising repair. We can supply this if required. To specify the system please supply a drawing identifying length of runs, section size, fixing option and details of additional items. We will be pleased to assist in the specification process. We will supply a Design Reference Number which can be included in the Bill of Materials to prevent error. Clear specification always make life easier on site.